Camarosource.ca V4.0 - Camaro Message Board • View topic - wacky tach? Anyone else out there got a tachometer that runs at like 2x or 3x real rpms? I have no idea whats causing it, its not really a problem... just an annoyance because you never know your rpms. Mine is way off too. I have heard it is a problem with alot of the later 3rd gens. I haven't ever come across a fix for it. 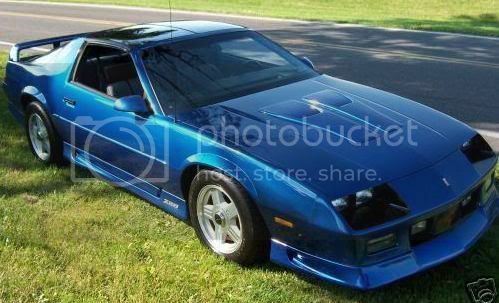 1991 Camaro RS 3.1 V-6, Flowmaster exhuast, TPI air intake, Hypertech chip, 180* thermostat, accel super coil, white face glow gauges. Yeah, I guess the previous owner of my car did some wiring to the car. I pulled some unatached ground wires out from undernieth and he had some switch wiring that was hidden below the shift plate. Just wasnt sure if his bad wiring caused my tach wires to be reading a different voltage somehow. Do you know what year they switched from mechanical tach to electronic? I think they switched around 90 but I am not 100% sure. That's not too uncommon.. When I had my custom chip programmed, a laptop was hooked up which showed all the information live. All my other guages were perfect but turns out due to the speed limited GM used in the car, when I was pushing 7000RPM, it was really only 5000 or so..
Did you get yours fixed by any chance CS? When im cruising at highway speeds my tach is topped out past red line and holding itself at the end of the tach itself. Part of the custom chip programming was to remove the limitations so it was removed, yes. So a chip can be programmed to get rid of this bug correct? Im not sure I understand when you say Limitations. Here is a copy/paste of what they have on their site. They are an sponsor on here, banner above. If you've upgraded to high-performance tires, chances are you're missing out on additional speed. Many vehicles these days have an electronic speed limiter. Manufacturers typically limit the vehicle's speed to the original tires' speed rating. This is far less than your vehicle's true top speed potential. In addition, if you've switched to a tire with a different overall diameter, your speedometer will read incorrectly. An update to the engine controller will help develop a trusting relationship between you and your gauges. You may even save a few dollars on speeding tickets! Now you can reach new speeds at an affordable price. CS that sounds like its if you've changed tire diameter. My tire size is stock and my speedo works fine. Its just the tach thats running wacky. yeah reading that advertisement, it doesnt seem to have anything to do with the tach. All they are doing is recalirating the speedo for bigger tires, and removing the top speed shut down. Unless they are talking about removing the rev limiter on the car. I can see that maybe messing with a tach. My tach shows double too. My car sat for almost 6 years, and I don't remember it doing this before that....but maybe. I also threw in a new MSD GM coil(before she sat), maybe that screwed it. I would like to know where the tach gets it's info from. I've heard it's the coil, so I might try and switch a stock one in there. I know my truck takes it from the alternator, but not sure on these cars. I read an article somewhere that had a fix for most of these tach problems.....something about some diodes in our guage....some really technical crap.....too much for me (and most others). Would be nice if someone could put the answer into simpler terms. I found it over at http://camaroforums.com/ I'm sure it wouldn't take long to find. This seems to be a commin issue. I hear replacing the whole cluster can fix it....but thats expensive!!! But yeah, can someone please tell me where our tachs pick up from? Mine is a '90 IROC with the new style cluster. Hi CORMOR. Don't know if you've fixed your overeading tacho yet, but I had the same snag on my old 1990 RS 3.1 v6. Even bought an ignition module in an attempt to fix it (it didn't). It appears it's very common on 1990 - '92 Camaros. Looks like it's to do with some circuit board which can be corrected by swapping capacitors on it - all a bit much for my level of expertise. This link explains what you can do if you feel you have the "know how". I've just traded my 90 3rd gen in for a 95 3.4lt v6, after almost 19years together! Still miss her, but love the newer one! Thanks Phil. I used to donate my time at an electronics recycling center and the gentleman, Jim, who ran it was an engineer who taught me some soldering among other knowledge for life. I'll give that thread a read through and hopefully put it to use in the spring. Im sorry for your loss... hopefully your new marriage will be worth its time.